Think Pink in this comfortable hoodie sweatshirt. The 7.8 oz. 50/50 cotton/polyester blend is ecofriendly, too, with the polyester being up to 5% recycled plastic. The patented low-pill, high density stitching means this hoodie will stay looking great. Our pink hoodie sports a dyed-to-match drawcord and extra large front patch pocket. The Hanes ComfortBlend Pink Hoodie is perfect for your Cancer Awareness events, pageants, and all of your activities. Available in adult sizes Small - 3XL. Also available in youth sizes. 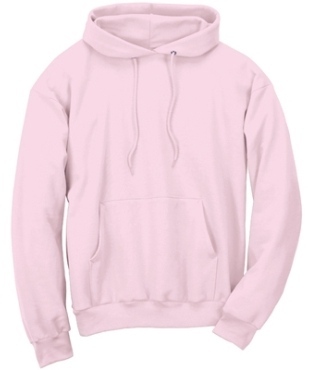 Q: Is THIS PALE PINK ADULT HOODIE IN STOCK IN A SMALL?? A: Yes, it is in stock.